Just like so many of you, we love an avian identification challenge. Thanks to the 10,000 Birds Clinic, we certainly get our share. The beauty of this arrangement is that even when the three of us are stumped, we have a veritable birding brain trust to turn to. That’s where you come in! 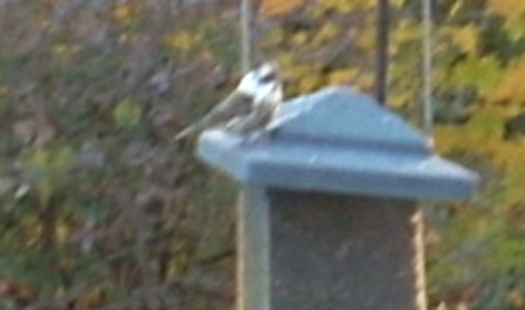 I need help identifying a sparrow(?). This bird was at my feeder in Western Massachusetts late afternoon. 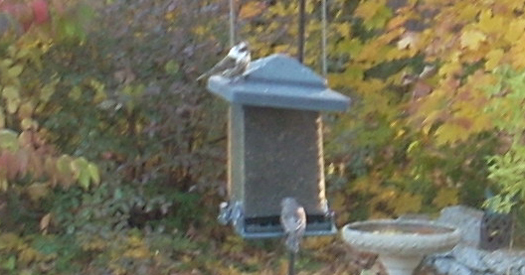 It was with other sparrows and finches. It had a bright white 3/4 inch band around it neck, with a beautifully streaked breast and sparrowlike markings on its back. It’s head had white, gray brown and it looked a slight bit tufted. Any help would be appreciated. Based on the description alone, I posited either a White-Throated Sparrow or Lapland Longspur. though I’ve never heard of one of the latter birds of winter beaches and fields hitting a feeder. However, based on the photos Wendy followed up with, I was probably wrong. Now I have another guess but see no reason to hog all of the ID fun. Possibly a partially leucistic Purple Finch. Take away the white in the neck and it looks pretty standard. Think Nate’s right. It’s decidedly stockier and shorter-tailed than the House Finch it’s sharing the feeder with, and the big auricular patch appears to have been preserved. My first thought was Purple Finch, based more on the stocky size and what appears to be broad streaking on the breast and belly. Yes, I’d say abarrent Rose-breasted Grosbeak (too late, I presume, and a bit too long-tailed?) or – more likely – Purple Finch.